This morning, the website Environmental History Now went live with my personal meditation on trying to ground self and scholarship. I put a lot of heart and thought into this, and encourage you to give it a read, whether or not you are in academia, also on the job market, or an environmental historian. The website, in its own words, "showcases the work and expertise of graduate students and early career scholars in environmental history of color and/or who identify as female/non-binary." It promises to be a great new resource for both professors and the public and I'm honored to have been invited to write for Environmental History Now's debut week by founder Elizabeth Hameeteman. Once you're done reading my piece, please click around to enjoy the work of other fantastic peers of mine. 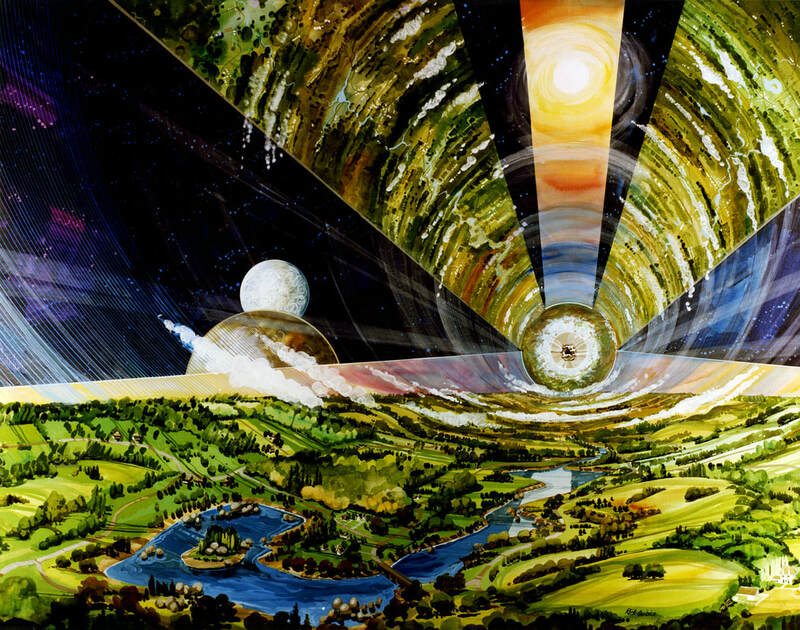 Amazing artistic depiction of what the interior of an O'Neill cylinder space colony might look like from NASA's "Space Colony Artwork From the 1970s", courtesy NASA Ames Research Center. Kudos also to Michael D. Gordin's essay "The Unseasonable Grooviness of Immanuel Velikovsky" for introducing me to this image within my current bedtime read: Groovy Science: Knowledge, Innovation, and American Counterculture (Ed.s David Kaiser and W. Patrick McCray. Chicago: University of Chicago Press, 2016). Talking About Democracy and Agriculture -- my podcast debut! Thanks to the wonderful folks at Edge Effects and especially editor Kate Wersan, I had the opportunity to interview two of my intellectual heroes for a podcast episode. Listen to our conversation, or just read an abbreviated transcript. Last year at the tremendously successful GAFS Future of Food Studies conference in St. Louis, I threw out a provocation. Inspiration struck in the form of fantastic papers by Sarah Peterson and (current journal Editor in Chief) Catie Peters , as well a recent article by former GAFS president and Assistant Professor at Rutgers Carla Cevasco, entitled "This is My Body: Communion and Cannibalism in Colonial New England and New France." I declared that I wanted an entire panel organized around cannibalism for the next year's conference. ​Well, that time has come. The Future of Food Studies conference will be October 4-6, 2018 at the University of North Carolina at Chapel Hill. We have launched our CFP inviting panel and paper proposals, due July 6, 2018. I was and remain serious about my call for cannibalism. Almost anyone who has eaten food is aware that food is pleasurable, and that it fosters spaces of sociability and connection. Food is delicious. Food is fun. I want to personally invite submissions of papers and presentations exploring the histories of food that are less comfortable and comforting. Because food is not always good. Food has not only served as a catalyst for horizontal connections among members of shared communities, but also as a conduit for expressions of raced, classed, gendered, economic, political, and ecological power. I want to suggest that it isn't just Soylent Green that is people, but many of our major food systems that kill, maim, injure, enslave, and erase less privileged populations. This has been happening in times and places exotic to white middle class Americans like "Darkest Africa" in the age of empire but also in places as familiar as Florida in the twenty-first century -- or even the local Whole Foods. Put another way, I want not just papers about cannibalism, but cannibalistic papers; papers that devour and digest the field of food studies itself. When we look upon the organization of GAFS and the field of food studies more broadly, what type of stories are we telling and which stories are left out? Which scholars and perspectives are we elevating? Which scholars of food are finding more comfortable homes for their scholarship elsewhere, and why? What structures of power are we ourselves complicit in through our scholarly practices as well as our intellectual work? These questions should be constant food for thought, and will require much mastication. ​Dig in, load up your plates, and send your ideas our way. Just today a piece I wrote about the White House Vegetable Garden went live on the Washington Post's website! The Real Scandal at the EPA? It's not keeping us safe by Frederick Rowe Davis. As the (brilliant and generous) editors Brian Rosenwald and Nicole Hemmer write: "In order to make history, we first have to understand how history has made us." If anyone has short pieces they would like to volunteer for workshopping with Dr. Steven Pyne during an open workshop session at ASEH 2018 in Riverside, California, please send your writing of 1000 words or less to anastasiaday@me.com by March 4. ​We are particularly interested in submissions from graduate students or early-career scholars. These short pieces can be excerpted from larger projects and do not need to be complete in themselves: we are ideally looking for a brief profile of up to 1,000 words on a person, place, event, idea, institution, or some other entity. Historians write with the hopes that someone will someday read their work – and perhaps even enjoy it. Strong, compelling, and jargon-free writing is crucial to reaching both academics and the wider public. Still, few graduate programs have classes dedicated to the art of writing; most historians teach themselves through trial, error, and isolating hours of self-critique punctuated by feedback from a trusted mentor or friend. At ASEH each year, panel discussions parse arguments, methodology, and interpretation, helping the panelists to write good history. This session hopes to spark broader conversations among environmental historians about how to write good history well. This session will feature former ASEH President Dr. Steven Pyne, who has taught graduate courses in nonfiction writing and conducted other writing workshops. Through discussion of writing-in-progress, Dr. Pyne will explore and develop the literary dimensions of historical writing. Attendees will be given the chance to participate, asking questions and weighing in on how historical writing can become not just functional text, but readable narrative. The ASEH Graduate Student Caucus is pleased to present a professional development workshop appropriate for both the undergraduate student and the senior professional historian. Three or four short papers will serve as the focal point of discussion; attendees are encouraged to read the papers beforehand. There will be copies at the door, but papers will also be distributed to any interested parties before the meeting; prospective attendees should email anastasiaday@me.com . Join us on Saturday at 1:30 PM, Room MR-1! I cried a lot my first semester of graduate school. Some of my tears were from rewatching emotional episodes of Scrubs, some were from loneliness, some were from imposter syndrome, and some were because I actually was significantly underprepared for certain elements of graduate school. Among the most bitter tears were those that made me question my commitment to history as a discipline, my belief in understanding the past as a way of shaping a better future. My first semester of graduate school, I took a (wonderful, incredible, amazing) course entitled Cultures of Consumption. Over the semester, I learned in greater depth than ever before how every single purchase I made that enabled me to live, to get to campus, to complete my coursework, to stay warm and fed and clothed, all contributed to deep social, economic, and political inequities. I bought organic produce when I thought I could afford it . . . but not always. ​I avoided animal products when I could . . . but eggs were such a cheap, easy, and delicious form of protein. I still bought avocados from across the globe when they went on sale. ​I still purchased breads and pasta undoubtedly full of GMO monoculture crops harvested with machines bought with the help of government subsidies that help kill family farms and dependent on an underclass of migrant labor. There were better purchasing choices available to me that I did not always take advantage of. Here I was, a ludicrous exaggeration of the informed citizen. I had a boatload of privileges that enabled me to get to graduate school, to accrue knowledge and think critically, and still I found I could not implement basic changes in my lifestyle based on my historical knowledge. What hope could I have for an America full of people with less privilege, fewer choices, and more constraints? Could it be that education is not enough, that in fact, more knowledge could make *no difference at all* in people's actions? I'm still not a perfectly ethical consumer. However, today, in the age of Trump, I have more faith than ever in the power of history. I've come to understand that it's not always the little things we do to get through the day that show history's grip on us, but the bigger arc of our lives, values, and (yes) our votes. I've spent a lot less time judging myself and others. Relying on small, individual actions to save the world in the vein of 50 Ways To Help the Planet is great for the daily conscience, but more fundamental personal reorientations and systemic solutions are required. Virtue-signaling cannot save the world. I've spent more time listening. The truth is, history does inform daily lives and actions. 99% of the time, when you listen to pundits, or even everyday people, the arguments they make about society, economics, and politics ARE a historical argument. "Just think about what the world was like only fifty years ago, when the College of Agriculture was a small, five-man department that taught its students in a few old army barracks. Back then, the big challenge was navigating the soils found in the hills and valleys of southern Illinois. If you could master that, you were ready to graduate and live the farming life, knowing that it would be enough to provide for you and your family. And even if you didn't go to a fine school like [Southern Illinois University], in those days you still had a shot at the American Dream. Because whether it was on the farm or in a factory, a middle-class job that paid a decent wage and good benefits was easy to come by - and it would probably last you a lifetime. Hard work and sacrifice paid off for most families, and because of the wealth they built, America's economic leadership was unchallenged." "We know that our nation was founded by farmers. Our independence was won by farmers. Our continent was tamed by farmers. So true. Our armies have been fed by farmers and made of farmers. And throughout our history, farmers have always, always, always led the way. Are you surprised to hear that, farmers? I don’t think so. (Applause.) You have led the way. Great people. ​The men and women in this room come from different backgrounds and from all across our land, but each of you carries the same title that’s been proudly borne by patriots and pioneers, inventors and entrepreneurs, the title of — very proudly — American farmer. Thank you very much. (Applause.) You embody the values of hard work, grit, self-reliance and sheer determination we need to — did you ever hear this expression? — make America great again. " Both Donald Trump and Barack Obama's visions of the agricultural past include references to the hard work of farmers as virtuous, and tie this labor to a mythical golden era in the past -- in Obama's case, when "you still had a shot at the American Dream" and in Trump's case, when America was "great." The farmers revolt of the Populist Era, the centuries of slavery on American farms, the decades of share-cropping, and the fact that most agricultural labor in the twentieth century has not been done by 'farmers' but by migrant labor would complicate both of their histories. ​Both Obama and Trump also highlight the conflict between the landscape and the farmer: Trump claims farmers "tamed" the continent, while Obama presents the landscape as a "challenge" overcome with education at a College of Agriculture. What would it mean for each of their viewpoints on the future of farming to acknowledge that the federal government has been the largest driving force behind expansion of farmland throughout American history, through subsidies of irrigation, railroads, and crops? 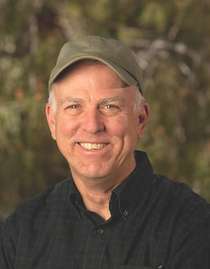 As September 2018 nears, when most parts of the 2014 Farm Bill will expire, historical opinions about the direction of our new Farm Bill are sure to fill the news. Too often, along both sides of the aisle and many points along many political spectrums, the histories people cling to are fictitious, invented, and purely self-serving. Nonetheless, I take comfort that this betrays a fundamental truth: people find history important and validating. Everyday Americans consider history essential evidence in constructing their self-image and identities, whether they realize it consciously or not. Even if they are using history for hateful ends. Even if they aren't engaging with historical facts. Even when it seems like history is some great game of madlibs where you get to insert your own values to see the story you want to see. But I see this as an opening--one that I have the privilege to be able to wedge further open, because I present as a non-threatening, educated, middle-class white person (even if I am steamrolled by mansplainers from time to time). History does matter to people. This helps keep me writing, researching, talking about history, and believing that the work I do everyday matters. This is one reason why I am a historian. Please read the entire thread by the awarding-winning astrophysicist (and frequent target of toxic masculinity on the internet), Dr. Katey Alatalo. Link in pic. Story time: I still recall with bitterness a very specific turning point in 7th grade where the teachers chose who was going to be in the most advanced math section. Mr. Dryer literally stood at the front of the room and with a (perhaps exaggerated) show of nonchalance picked out 7 individuals to be in his class. It was as if he were picking teams for handball or ponies at a track. I was not selected. I had all As. I was a grade-grubbing teacher-pleaser and internalized this 'failure' deeply. By high school I embraced being good at humanities--in part because I found amazing female role models that were largely lacking in the math faculty. (Due credit to Ms. Brigance who taught me not only Latin, but ran independent studies in Sanskrit and ancient Greek.) When it came time to think about dropping one of the AP courses from my schedule because taking so many while struggling with depression and varsity running seemed unwise, it was obvious that AP Calculus (and senior year, physics ) was on the chopping block. In college, after avoiding all the math and science I could (with the exception of environmental studies), I wound up taking higher-level analytic and logic classes for my philosophy major; my undergraduate thesis lay at the intersection of modal logic, set theory, and philosophy of language. I found myself in rooms full of math and physics double-majors, asking about all their other classwork. I particularly admired the femme students among them and often wished I had continued on with math so I could engage more fully with their work. I occasionally longed to be in their topology class too, so I could could talk about the cross-pollinations between that and the set theory we were learning in philosophy. It was at this relatively late stage that it became clear to me: of course I could have done it! (At least through the B.A.) But nonsense from both outside and inside my own head stopped me starting in frickin 7th grade. Now, I'm not saying I would or could be an award-winning mathematician if it weren't for Mr. Dryer. I am saying that I am a classic case study in social forces that cause us to have fewer female students in STEM -- and my story is one of the more positive ones! I never experienced sexual harassment or any of the associated discomfort that so often can come with being a female in male-dominated spaces. My supportive and brilliant advisor in Philosophy was male (as were my advisors in the majors I nearly completed in Classics and English). I had examples at every step of the way of brilliant femme friends who were succeeding in math and science. I had parents who encouraged me unconditionally and wanted only the best for me. But now, even in history, I still experience occasional problems related to my gender. I continue to have "disagreements" with senior male historians who "don't believe" my numerical claims, taken straight from archival research in government sources. While sometimes it is intellectually flattering, it is often distinctly gendered when people are surprised that my 'garden history' touches on 'big' issues of political-economy, capitalism in midcentury America, and doesn't confine itself to social history topics like gender and the home. (I have talked to multiple male historians of gardens who have not shared these experiences.) I have missed out on a significant professional opportunity almost certainly because I declined a date with an influential older male historian. I have suffered from negative student feedback linked to gender. But I'm not just complaining, I'm working to fix it. As always, I'm proud to be part of the American Society for Environmental History, actively working to tackle gender bias in its ranks, and to serve on the ASEH Committee reviewing the report on this problem (pictured left). I'm also a proud member of the Coordinating Council for Women in History and do my best to support and highlight my brilliant peers of all genders, races, ethnicities, and backgrounds. All this is to say: screw James Dalmore, the latest New York Times article (that I refuse to link to and give hits), and anyone who claims that we need to seriously consider any arguments for biological differences in STEM aptitude, or aptitude in any human endeavor. We can have those discussions someday on the basis of good science (hopefully produced by female-identifying scientists in equal measure) only once we have removed the social barriers standing in the way of so many brilliant women, minorities, and other underrepresented groups. Prove your specious arguments by making opportunity truly equal and watching what happens. Until then, I really don't want to hear it. But I wanted to raise a couple of other contemporary issues to think about this Labor Day. Some of these are rooted in the problematic history of the labor movement itself that we celebrate today; unions often served to protect hierarchies of race, class, and gender in history, even as they claimed to be committed to undermining these inequities. (While my linked examples are from World War II, the history of the American Federation of Labor encapsulates this story well on a longer historical timeline.) Service labor falls clearly within the legacy of labor that is classed, raced, and gendered in ways that have made it often fall outside the protected interests of nineteenth and twentieth century labor movement. Here are some topics to chew on. Undocumented Immigrant Labor. While we should absolutely continue fights to raise the minimum wage to reach above poverty-levels, let us not forget to fight for the %5 of the nation's workforce who are undocumented and cannot expect even minimum wage, basic safety and other workplace rights, and may not feel they can safely file grievances or advocate for themselves. Our economy depends on these workers, most of all in our food systems; their below-poverty wages or even slavery subsidizes the cheap foods that some Americans still cannot afford. Environmental risks to labor -- in agriculture and elsewhere. The data is adding up, although people (and the environment!) have been experiencing the deleterious effects of industrial, chemical-intensive agriculture for years. We need to not only be worried about the pesticides in the food we *eat,* but also about the workers who are exposed to those pesticides much more directly in the fields, day in and day out. Let's move beyond the consumer-centric-mindset when we think about reforming our food systems and we may just wind up with agriculture that is good for everyone: producers, workers, consumers, and the planet. This image captures the intersection of these three themes perfectly; I snapped a pic of this photo while doing research at the National Agricultural Library, so forgive the quality. The back is captioned: "Asst. Home demonstration agent giving insect control to 4-H club members composed of Mexican girls, Wharton County, Texas. (1939). Too often, well-intentioned efforts to 'uplift' and 'improve' the lives of labor have been coming from the top-down, with all the blind spots and flaws that includes, whether in the USDA or in a union. In short, just because agricultural jobs are shrinking in number doesn't mean that agricultural labor doesn't matter. Whenever you eat food, you are implicated in these broken systems. Because the problems are so endemic, I don't think it will be as clear-cut as a boycott of a single company or product; although these can be effective stages of a larger resistance, as demonstrated by Cesar Chavez with his Grapes of Wrath boycott. ​Let's think beyond the consumer-centric mindset to also include workers and producers when we try to reform our foodways. If we include those who grow and harvest our food in our calculus of what makes for a sustainable food systems -- and equitable labor systems -- then we just might end up with a society that is better for everyone, and for the environment too. 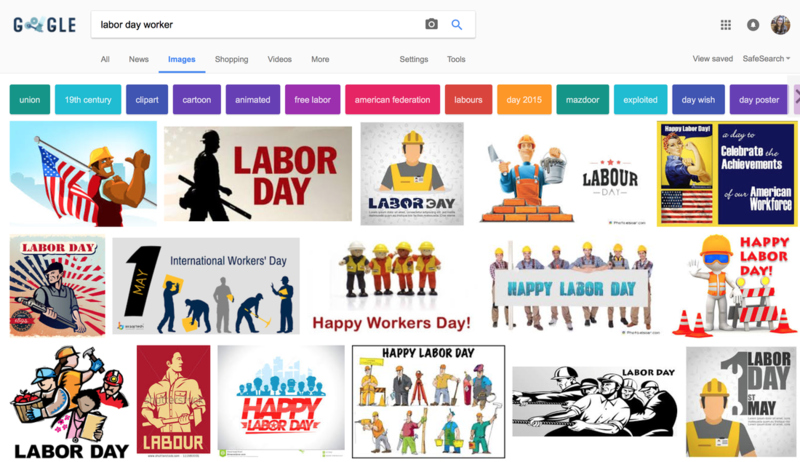 Next labor day, I want to see more complex representations of labor than my google image search from this morning. Let's get to work. I kicked off very busy and exciting June this year with a trip to Bologna, Italy where I had the fantastic opportunity to feel like the least interesting, least brilliant person in the room for discussions of some of my favorite historical topics. If there's a better way to start a summer, I don't know of it! This May 30 and 31, I was lucky enough to be one of twelve invited participants at a workshop sponsored by the Rachel Carson Center for Environment and Society entitled "Household Consumption and Environmental Change in the Twentieth Century." Consumption is a crucial dimension of present-day environmental debates. From meat to automobiles, from tourism to electronic gadgets, multiple dimensions of individual and group consumption are questioned from the perspective of their impact on the environment and their share of responsibility in the global ecological crisis. How this relationship has been built, both discursively and in its material underpinnings, throughout history? While consumption studies have shed light on the subjective and often political dimension of consumer culture, environmental history has emphasized the material outcomes. We think that only by combining these two historical perspectives it is possible to fully understand the contradictory place of consumption in present-day environmental debates and politics. While every single facet of this conference was incredible, here are a few of the things that left the biggest impact on me and my thinking. ​First, the panel I presented on was incredible. I found myself of being in the curious position of talking about trash compactors while other panelists talked about gardens! Michelle Mart's probing exploration of local food in the American late twentieth century included an examination the historical legacy of Victory Gardens and their impact on contemporary valuations of 'local food,' much to my delight -- I cannot wait to read the book that comes out of her research. ​Elisa Tizzoni, on the other hand, traced ideas of sustainability through women's food magazines in Italian history -- a lens that rounds out more mainstream gender, labor, and domesticity analyses of women's popular periodicals! Daniel Philippon, with his meditation on "Kitchens of the Great Anthropocene" also used tools of literary analysis to pose questions about sustainability, but centering on the kitchen and the act of preparing food. This paper reminded me anew that good analysis is made breathtaking when paired with thoughtful, literary writing -- not hidden by it! I contributed to the conversation by sharing an object biography of what I present as a technological failure: the residential trash compactor. While the reasons for its failure are myriad (issues of repair, energy use, smell, creation of heavier trips taking garbage out to the sidewalk, etc. ), more interesting to me are the reasons for its invention and early popularity. I think that the life of the trash compactor reveals a complicated story about American's relationship to their own generation of household waste -- and the various ways they grappled with guilt about the act of disposal. The design speaks as much as the content of this amazing image! Other highlights included revelations about how municipal water supply systems and the consumers they served co-created modern standards of hygiene and bathing practices, in a paper from Nina Lokowski. In short, Sunday bathing-days originally stemmed from efficiency of effort in heating water over the kitchen stove; with the advent of municipal hot water systems under different energy regimes, there grew an incentive to change bathing patterns to be more evenly distributed across the week to keep the supply constant. Finally, two papers made novel uses of unusual sources for telling their histories, affecting my thoughts about methodology and ways of telling stories about the past. First, Rebecca Wright opened my eyes to the amazing environment/consumption history research possibilities -- and problems! -- within the Mass Observation Archive. The archive was generated by sociological observations of British life starting in 1937 and truly, you should read read more about this massively strange and wonderful phenomenon. On the other hand, Nina Möllers from the Deutsches Museum of Munich, Germany, presented an analysis of museum exhibits that made meaning out of the silences therein; she argued the environment was an 'invisible issue' in exhibits on energy and the home. I love critical examinations of museum practices as a growing genre of historical writing and this paper gave me a new way to think about how I might be able to use such evidence in innovative ways. This workshop had at its very center the issue of scale -- how can we view the global environment through the lens of a single household's consumption? This question of scale is, I think, central to the entire environmentalist movement, and not just us historians. How *is* the individual or the household connected to the whole? How can historians help us clarify these complex connections across scales? How can environmentalists make people see global warming in action every time they turn on the car in their driveway -- and also when they cast their vote in national elections? I think this workshop drew attention to the tensions between individual, structural, institutional, and natural agency in ways that would enrich the work of any historian -- or any policy-maker in our twenty-first century halls of government. These conversations will surely inform my own work for years to come. I must end on a note of gratitude to the Rachel Carson Center for sponsoring this wonderful workshop, to Giacomo and Paulo for organizing it, and to all my fellow participants for sharing their wonderful work, explaining an aperol spritz to me, and giving me fantastic feedback for how to move my project forward. Let's do it again sometime! 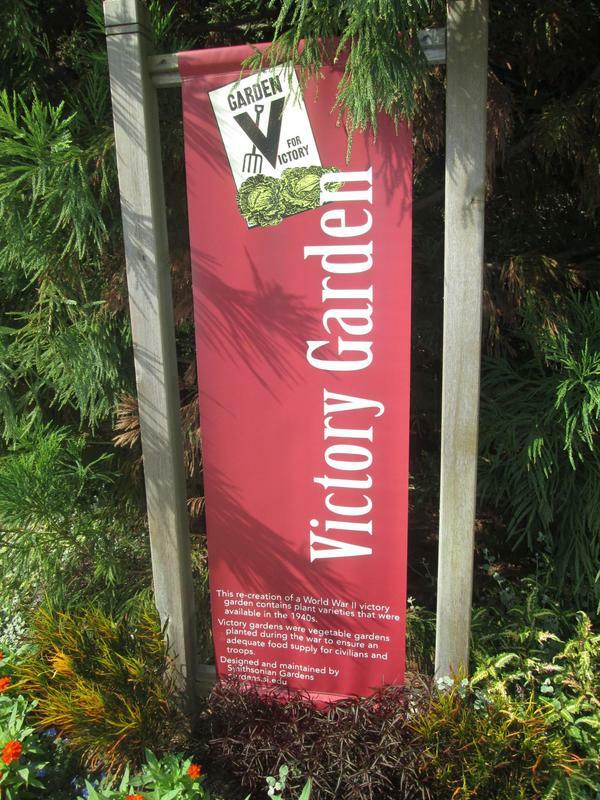 In 1944, Betty Peek from Macon County, North Carolina was the high-school division champion of the national "Green Thumb" contest, sponsored by the National Victory Garden Institute. "​Plan your garden, work to those plans, have the determination to carry your plans to completion, and conserve what you grow." I should have listened to Betty last garden season: while I began with a plan, the plan never took into account my household's food needs, succession plantings, even distribution of labor over the summer, or the labor of conserving and cooking the food after harvest. This year, I was determined to do better. I was going to plan early, plan well, and plan hard. I was going to plan for everything, just like Betty told me to. CHF as seen from Chestnut Street. Of course, before planning my garden, I needed to plan my work and writing. I was lucky enough to be the recipient of a Smithsonian Institution Fellowship earlier this spring. I thought to myself that perhaps I could schedule my research around the garden season -- or perhaps be a 'weekend gardener,' dashing up to Delaware to oversee my plants in between weekdays in the archives. Much to my delight I then received another fellowship offer (also four months long) at the Chemical Heritage Foundation in downtown Philadelphia! I couldn't be more excited to join the amazing community there of museum professionals, scholars, and #twitterstorians. While in residence, I'll be researching how industrial agricultural chemicals developed and then entered the domestic space of the garden in World War II as well as using their amazing archives to flesh out other aspects of my dissertation already in progress. Between my two residency commitments - and a June that involves three conferences for me! - I just didn't see how the garden was going to come together for me, or how my experiment could continue for the 2017 season. All my plans to plan my garden were in disarray. I didn't know how to schedule garden success while facing a year of amazing research opportunities far afield from my backyard patch. To compensate for a year with no brussels sprouts (the few I planted in an odd corner were eaten by rodents! ), Tim has planned almost 20 feet of them. I still aim to work the garden, but more in the role of children shipped from their urban schools out to the countryside to help with labor shortages than in the role of garden manager, as in last year. I have big plans for the Victory Garden of 2018, but this season's priority is to grow the chapters of my dissertation. ... And, of course, spend lots of time getting lost in the Smithsonian & Chemical Heritage Foundation collections! Historian-in-the-making. Writes about environment, food, people and how the past informs the present.